The Tru-Form Pro Keyboard built-in touchpad eliminates the need for a mouse and saves valuable desk space. The Glidepoin Touchpad puts computer control at your fingertips. Navigate, scroll, zoom, access files and enter data all with just a light touch of the finger. The built-in hotkeys allow users to connect directly to their media player and popular Windows applications. With a single touch users can surf the Web, navigate music and video clips, and start many frequently used Windows programs. Introducing the improved Tru-Form Pro by Adesso. The original Tru-From sets the standard for ergonomic computing. 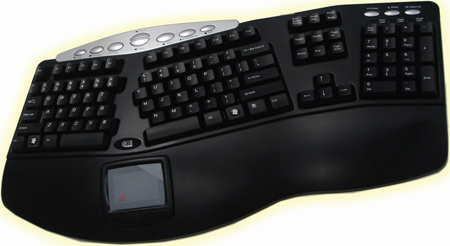 It features a contoured, split key design for ergonomic comfort with a built-in Touchpad. The innovative touchpad includes a left and right mouse buttons and built in wrist support. The integrated touchpad eliminates the need for a mouse, which also saves valuable desk space. The Adesso Tru-Form Pro also offers multimedia keys that make this keyboard a comfortable, multi-featured keyboard that combines a host of Windows and multimedia shortcuts and controls in a comfortable, stylish and ergonomic design. Keyboard Dimensions (LxWxH) 19.25" x 10.75" x 2"
Package Dimensions 18.25" x 7.25" x 1.38"